European Forum Gastein 2018: Economics matters! During the last edition of the European Health Forum in Gastein, interesting questions were debated. One plenary session was specifically dedicated to investment. We know that strategic investments in health are required but shouldn´t we also discuss return on invested capital (ROIC)? The first benefit concerns clearly the patient, patient satisfaction with care delivered by attentive health professionals. The second one must be economic adaptation and how to provide quality care at a reasonable cost in all EU Member States while respecting budget limitations. The answer to this complex question is the private sector specificity, limiting unnecessary costs by managing a talented workforce and offering modern treatment solutions. Our challenge is to concretize the framework presented in Gastein, transforming the idea into a reality accessible to all European Citizens. The agenda of the day is now available HERE ! We would like to thank the Polish Association of Private Hospitals, PAPH, Dr Andrzej Sokołowski and Dr Piotr Gerber and the whole PAPH team, for their warmest welcome and outstanding organization during the latest UEHP Council Meeting in Warsaw on September 28. Thank you also to Mr Maciej Milkowski, Undersecretary of State, Polish Ministry of Health, for attending our meeting. The European Commission created the European Artificial Intelligence Alliance, a forum engaged in a broad and open discussion of all aspects of Artificial Intelligence development and its impacts. We are glad to annonce that UEHP applied for the membership and was accepted! We look forward starting this new adventure with the full support of our members! On October 18, the International Consortium for Health Outcomes Measurement (ICHOM) in collaboration with EFPIA and pharma.be hosted a full-day seminar in Brussels on how to drive healthcare systems towards becoming more outcomes-based, patient-centred and efficient through the standardised measurement of patient-relevant health outcomes. Throughout the day, expert presentations guided the participants through the theory and practice behind measuring health outcomes, how ICHOM standard sets in different disease areas are constructed. Participants also heard several practical case-studies on how the consistent measurement of outcomes can improve care for patients, which as a result will also help ensuring smart spending of healthcare budgets. The second part of the day was dedicated to two panel discussions - the first with stakeholders from the Belgian perspective and the second with EU-level policy makers and stakeholders - both discussing how to put this model into practice on a larger scale, the barriers to implementation and how national and EU policy makers could help further this agenda in order to improve patient care while making healthcare systems more financially sustainable. UEHP was invited as speaker within the panel on the role of the EU in outcomes-based healthcare, bringing the voice of Private hospitals in Europe at the highest level of discussion. The private sector is a partner of the development of this revolution in healthcare where the patient will be for the first time at the very Center of all decision and actions. We are calling for full transparency at all levels and we are ready to share data in order to give the patient the added value he is looking for and to improve the whole experience of care for all citizens. On 10th the Integrated Care Alliance launched its Multi-Stakeholder Digital Health Roadmap at the European Parliament, kindly hosted by MEP Michel Boni. The Integrated Care Alliance was officially launched in June 2016. At this occasion, The ICA Partners published a Call for Action“United towards Integrated Care” that setsout ten recommendations for accelerating the development, uptake and scaling-up of Integrated Care models in Europe. Building on the Call for action, the ICA partners joined forces again to elaborate a Multi-Stakeholder Digital Health Roadmap which identifies Integrated Care objectives by 2021, and recommended measures for the implementation. The Roadmap was presented at the EP event on 10 October 2018. The event was successful, an opportunity to meet EU Institutions representatives and other key stakeholders, including patients and carers organizations, clinicians, healthcare providers and health IT industry representatives, and openly discuss the way to strengthen and expand integrated, sustainable health and care services across the EU Member States. UEHP has been a member of the Integrated Care Alliance form the very beginning! We are delighted to work with all the collegues from other associations working in the healthcare sector and to help shape the future of eHealth in Europe! 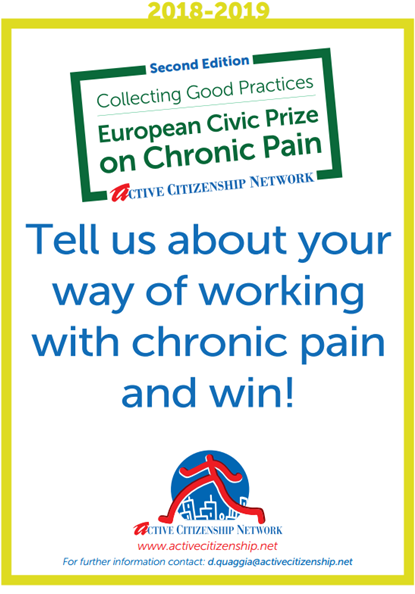 The Application period for the second edition of the bi- annual research-project at the European level “EU Civic Prize on Chronic Pain - Collection of good practices” has started. The award is open to any healthcare stakeholder: patients’ associations, health professionals, private and public hospitals, universities, etc. Your project will be considered for a public European celebration when the prizes are awarded and will represent the recognition of ongoing excellence. A representative from each of the entries that have been short-listed will be invited to this event. This will foster the formation of a network of good practice practitioners, able to share information, advice and practical help with each other. This the second of a series of prizes –awarded every two years – celebrating progress in the treatment and manage of chronic pain. This year the Nobel Prize in economic sciences rewards Paul Romer and William Nordhaus engaged in “endogenous growth” and climate change implication. The two major questions of economic development in a liberal model represent a big challenge for the future. First to link continuous economic development to creativity including new ideas by actors, enhancing research and development and protection of intellectual property. Second to respect global warming and climate change implication in a sustainable development project. How to link economic questions to our specific activity? Ultimately, the healthcare sector is clearly dedicated to one goal, individual well-being: care and cure represent our everyday work, it is the sense of purpose and the professional commitment of all hospital collaborators, from nurses to top management. At the announcement of the Nobel Prize award, our greatest concern can only be to enforce our implication in sustainable growth. Services to people and innovative organization models can embrace environmental issues. Under pressure from European Member States governments asking for more efficiency with less budget, we try to stabilize an incremental model respecting the future. We have to limit unnecessary consumption of materials, air and liquid pollution, patient and caregiver travels, and carbon emissions. As published in previous UEHP Newsletters, our implication in “green hospitals” is a reality as we continuously strive to promote health by reducing its environmental impact. The engagement of our members is notable, and recommendations of Nobel Prize winners is to be applied in real life. We are actors of changes, and we are therefore delighted with the result of the Nobel Prize award. We find here a very strong encouragement to maintain this collaborative process on a common objective. We are front runners to claim that private investment includes environmental protection even if restricted budgets are allocated to hospitals. Our responsibility is to accept this challenge and to succeed. The theory in Economic science is more interesting when applied in our everyday life action. The reinforcement of motivation is then strengthened by the application of a positive action recommended by international experts. We are concerned by economics questions, and we are proud to favor applications respecting both the people and the planet. Quality and relevance of care are one of the cornerstones of the Health System Transformation Strategy (STSS) introduced by the French Health Minister Agnès Buzyn. Private hospitals have long recognized and promoted these concepts. Putting them at the heart of the organization of our system constitutes a genuine paradigm shift and an opportunity to seize. It is a question of breaking free of an accounting approach to health, disconnected from the field, to better integrate the evolution of the patients ‘needs and the new expectations of health professionals. The final goal is both simple and fundamental: to enable everyone not just to have access to care but access to relevant care of proven quality. Quality of care is a key issue which cannot be reduced to a stack of medico-administrative procedures and rules. What is important is the time and energy that teams devote to the patient. It is therefore necessary to take medical quality into account remaining as closely as possible to reality, and to grasp with finesse what constitutes the "value" of a treatment, resulting from a balance between its therapeutic benefit and its human and financial cost. Only evaluation by "peers", ie specialists in each medical discipline, according to benchmarks developed with all stakeholders, enables the quality of medical practices to be assessed. It is a philosophy of action that the French Federation of Private Hospitals supports and argues with the Ministry and Health Agencies, because it is based on the acknowledgement of the value of skills. The patient experience is also something that the private hospital sector needs to integrate more into its approaches. Meeting the challenge of quality and relevance of care will only be possible with a patient who is both informed and responsible, co-builder of his care. We appreciate that, in PLFSS 2019, the share allocated to quality financing increases substantially. But adding coercive measures is ineffective. It is important to keep the positive and encouraging nature of the approach, so that it acts as a real lever for improving practices and consideration for the professionals. Continuously improving the quality of care is a powerful factor of motivation for professionals, but it is also, and perhaps above all, a question of finally making the service provided to the patient the foundation of all public action in health. The PricewaterhouseCoopers (PwC) indicators 2018 on financial and performance of German hospitals have just been released. This report compares the ratios of public, non-profit and private health care providers each year. For the study, PwC evaluated key figures of 100 German hospitals for the year 2017. German public hospitals are struggling with high maintenance rates, postponed modernization measures and are performing worse than non-profit and private hospitals in almost all financial metrics. This is in short the conclusion of the study. In average, personnel costs represented 60% of German hospital operating revenue, material costs 27%. Public hospitals scores are in average 8% higher than private hospitals. Although private hospitals handle less ‟cases” per full-time employee in 2017, the Case-Mix-Index calculating the severity of ‟cases” treated in relation with the amount of economic resources engaged, shows that private hospitals work more efficiently. The bed occupancy rate reached almost 78% in private hospitals for the year 2017, the best rate. German private hospitals also achieve the best ranks in the financial analysis part, liquidity, investment rate, indebtedness, etc. and show the highest own capital investment capacity. The EBITDA ratio for private hospitals amounts 8% (public sector -6%). Three outstanding innovations by private clinics have been rewarded by the Austrian Private Hospitals Federation in the frame of its second Congress in October. The first prize has been awarded to the Tyrolean private clinic Hochrum for its Surgical Skills Institute (SKI). SKI is a training and research facility, which will be used for advanced training for OR staff, the testing of new implants or instruments as well as research projects. A video transmission system between the OR, laboratory and lecture halls has also been foreseen. The second prize awarded the Ebody Ärzte App, an application developed by physicians from the private clinic Maria Hilf in Klagenfurt. This digital tool enables practitioners to access patients medical data, in a safe way and everywhere. Doctors not only keep track of treatment schedules, but also have access to findings and diagnosis. The third place went to last year's winner The Rehabilitation Center Münster for a therapeutic concept that supports the treatment of multiple sclerosis patients by learning a foreign language. The "Health a Priority" survey carried out under the "3F - Financing, Formula for the Future" project, promoted by the Portuguese Association of Hospital Administrators (APAH), concluded that Portuguese patients have a higher regard, in many aspects, for private hospitals than for public hospitals. The study was developed for APAH by GFK, a market research company. On a scale of zero to ten, public hospitals score 5.7, while private hospitals have an overall satisfaction score of 7.5. The survey also shows that 3 out of 4 Portuguese patients consider that Health is not a priority for the Government and that 7 out of 10 consider that the investment in health is insufficient. This report lead to ten recommendations to innovate the Portuguese Financing and Healthcare model, in order to truly place the citizen at the centre of the system. What is the place of your hospitals group within the Romanian healthcare system? MedLife is the largest private healthcare service provider in Romania. In the 22 years of MedLife’s activity, we are delighted to say that it has been through our actions that we have taken medicine to a different level, we have contributed to the accomplishment of important performances in the Romanian healthcare sector and we have proven Romanian patients that they can find, in their home country, the same expertise, technology and methods of treatment as they would find abroad, as well as extraordinary physicians, for whom the patients’ health comes first. Patients need full solutions, both for their diagnostic and for their treatment. That is why we developed the MedLifeHealthcare System, which includes clinics, laboratories, hospitals, maternity hospitals, centres of excellence, pharmacies and a stem cell bank, and it provides integrated healthcare services under the same roof. As regards its national coverage, MedLife means: 50 clinics, 20 hyperclinics, 155 sample collection units, 12 pharmacies, 10 hospitals, 10 dentistry centres, 4 maternity hospitals, 33 laboratories, 1 stem cell bank. The healthcare team comprises 2500 physicians and 1800 nurses, and over 5 million patients have visited us over the years. What is the shape and the history of your group? MedLife is a company that has developed organically and by associating with local entrepreneurs, with whom it has managed to build stronger centres. The MedLife Healthcare System did not choose a single niche – laboratory, clinical investigations, hospital, or corporate, but instead it chose all four. Consequently, the MedLife structure is a balanced one. MedLife is a business built by Romanians, with Romanians, for Romanian medicine. MedLife has consolidated its nationwide position both with its 20 acquisitions and by developing greenfield locations in key cities of Romania. The most important acquisitions in the past 3 years: DENT ESTET, Anima and Polisano. The MedLife Healthcare System is the only private healthcare company that comprises a second brand – Sfanta Maria laboratories. What are your projects / prospects for the coming years? MedLife will continue to invest in large-scale projects in development, extension, innovation and medical technology, but most of all in digitalisation and online media. At the same time, we have launched actions to see to what extent MedLifecan be present with its own units in neighbouring countries such as Bulgaria, Hungary, or Serbia. MedLife, through Sfanta Maria brand, is one of the largest private outpatient healthcare service providers having an agreement with the National Health Insurance House (CNAS). Sfanta Maria has a large network of general practitioners and specialist physicians having agreements with CNAS, it is a financially solid company, with a good quality of the medical act.